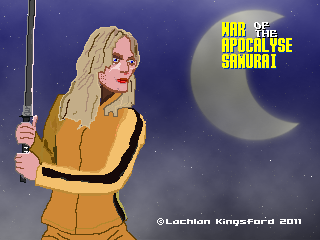 I really have a love of the potential idea of using The Bride from Kill Bill as one of the Samurai of the Apocalypse - probably as Conquest or Death. 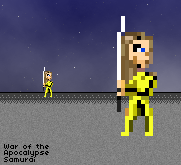 I can't think of a really good reason - other then it would be cool to fight the bride, and her personal army, the Reformed 88. Or something like that. What is here is a concept of a sprite for The Bride, and a title/talking/chapter screen art of The Bride.